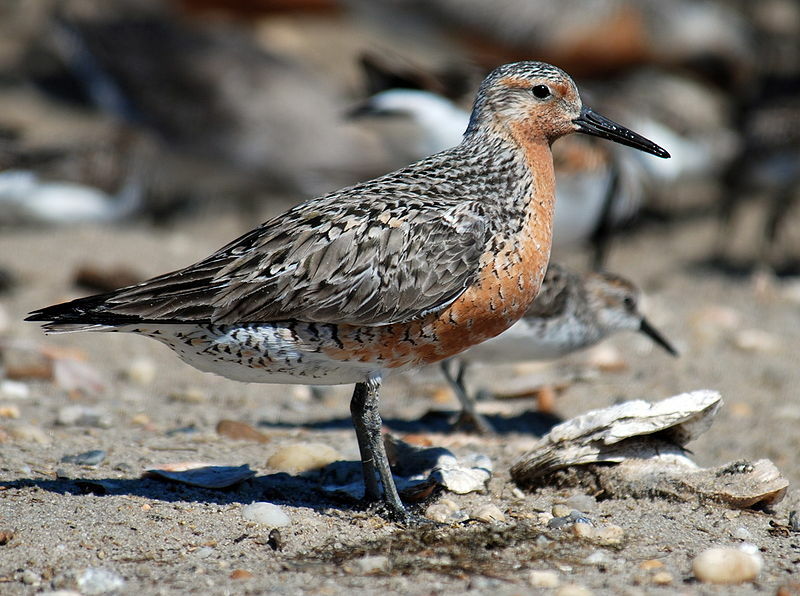 The New York Times recently reported that the population of Red Knots stopping over this spring in have doubled since last year compared to last year, likely the result of more stringent rules on the harvesting of Horseshoe Crabs, particularly in New Jersey, that nourish the shorebirds on their epic migrations. Approximately 26,000 knots were estimated to stop over on the shore of Cheaspeake Bay this year, up more that twice what it was last year. But one banner year for Delaware Bay does not constitute a comeback, scientists say. Horseshoe crabs are not only popular as bait; they are also prized by the pharmaceutical industry for their copper-rich blood, which is used in laboratories to test drugs and devices for bacterial contamination. Hundreds of thousands of the crabs are collected on the East Coast each year for that purpose. They are returned to the water, but somewhere between 5 percent and 30 percent die. The Atlantic States Marine Fisheries Commission monitors the use of crabs by the biomedical industry and has recently proposed establishing harvest levels for horseshoe crabs from Delaware Bay. The guidelines would use a complex formula that would take into account the abundance of both red knots and female horseshoe crabs. While still well below the levels seen in the 1980s, the work done by fisheries agencies and non-profits is undoubtedly a success story. It’s nice to know that such a small, easily taken, action in protecting the nesting Horseshoe Crabs can have some a profound effect on this gorgeous and fascinating, shorebird.